For the past four years the bagger trend has grown. We have all pontificated on the trends that will stay and those that are not long for the ride. The most discussed and divisive topic is the size of the ginormous front wheel. Here at Beantown Baggers we have publicly called 2014 the Year of the Rid-able Bagger. We highlight the excess as many craftsmen aspire to create bigger, glossier and more absurd than the next builder. We question the staying power of these bikes and have challenged the movement as a “fad”. Let’s be honest, we love these bikes! 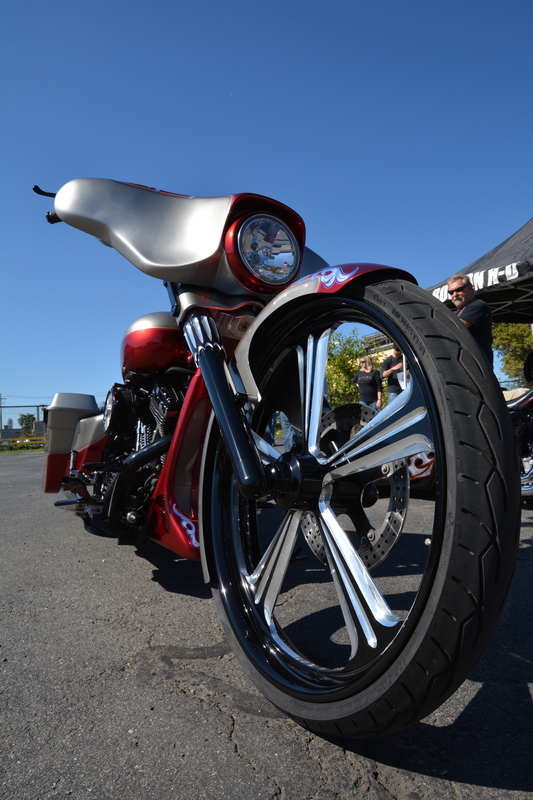 Big wheel baggers look insane. They are works of art and scientific marvels in many cases defying physics! Do you really think that you’re getting the same looks of admiration on your stock Honda, sporting scuffed paint and inaudible pipes as the dude on a ridiculously done up bagger? Sure, and my pimple faced, malnourished 17 year old self had a shot at the prom queen. You are smoking crack! Many words describe America, but minimalism is not one of those characteristics. As flag waving, gun toting, God fearing Americans we have a historical love of beautiful machines. We strive for excess wherever impossible and wake up every single day excited to raise a big middle finger to countries who don’t have our economy, our freedom or our values. To dislike the looks of these bikes is your prerogative but to abhor their existence is simply un-American! Next time you see a two wheeled, V-Twin opus symbolizing a priceless investment of time and creativity … The next time you see a wheel taller than your 1988 Yugo and the next time you are inspired to utter the phrase: “nice trailer queen”… stop for a minute. Ask the owner about his vision for the bike. Ask him where he has ridden it. More importantly, ask him to go for a ride. Isn’t that what this is all about? We all ride. We have different tastes and in this one case, bigger is in fact beautiful-er!